Theophan the Greek, also Theophanes the Greek, (Russian: Феофан Грек, Greek: Θεοφάνης), was one of the greatest iconographers of the Church of Russia. He lived in the fourteenth century. He also is noted as a teacher and mentor of the renowned iconographer Andrei Rublev. He was described in his day by Epiphanius the Wise as a renowned wise man, expert philosopher, famous book artist, and among all the iconographers as the best artist. Theophan was of Greek origin. He may have been born in Constantinople about the year 1340, although a Crete birth place has also been noted. Little is known of his early life, although he probably learned and developed his art in Constantinople and may have worked there and in the Crimea. However, none of these paintings has survived. Theophan moved to Novgorod in Russia in 1370 and, then, on to Moscow in 1385. Theophan is among the few fourteenth century artists in Russia about whom there is reliable documentary evidence. Chronicle sources note his painting the Church of the Transfiguration (Spaso-Preobrazheniye) on Elijah Street in Novgorod in 1378 and, in the Moscow Kremlin, the Church of the Nativity of the Virgin (Rozhdestvo Bogoroditsy) in 1395, the Cathedral of the Archangel Michael (Arkhangel'sky) in 1399 and, with Andrei Rublev and Prokhor of Gorodets, the Cathedral of the Annunciation (Blagoveshchensky) in 1405. 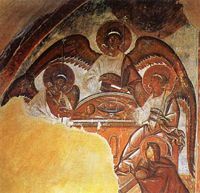 His frescos survive now only in the Church of Our Savior of the Transfiguration-in-Elijah Street in Novgorod. He has been noted for his style of painting from inspiration and not copying from prototypes. His style is considered unsurpassed in expression achieved by almost mono-colored painting. His paintings have great intensity that captures the spiritual essence of each figure. Among the best preserved images in the church are the magnificent image of the Pantocrator in the dome, the frescos of the Forefathers Noah, Melzhizedek, and Seth and the panel icon of the Old Testament Trinity. Theophan worked swiftly and did not use pattern books. He did not mind spectators. His figures tended to be very tall and severe, with dark faces and long, thin arms. The mystical elements in his paintings are believed to reflect the influence of Hesychasm. Some of his contemporaries noted that he appeared to be "painting with a broom", in reference to the bold, broad execution in some of his finest frescos, which are unique in the larger late Greek tradition. At the request of Epiphanius the Wise, Theophan produced a miniature for a Gospels manuscript showing a view of Hagia Sophia in Constantinople and the statue of Justinian I to the south of the cathedral. Theophon is noted also to have painted panel icons, but in recent academic debate his authorship of many of these icons have been questioned. The date of his repose is uncertain, but it is believed to be about the year 1408 to 1410. This page was last edited on December 11, 2017, at 16:39. This page has been accessed 11,183 times.